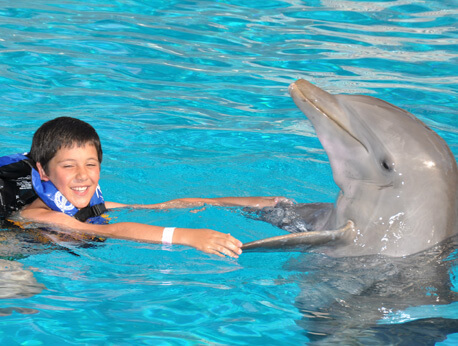 Experience the thrill of a lifetime when you visit Dolphin Encounter at Six Flags Mexico. Interact with these graceful animals in a unique and family-friendly environment. Learn hand signals that will allow you to communicate and play with our dolphins. The highlight of your encounter will be swimming in the water with these gentle mammals. Want to make your dream of swimming with dolphins come true? Enjoy the thrill of a lifetime at Six Flags Mexico with Dolphin Encounter. You and your family will experience a fun and unique adventure as you meet and interact with these amazing animals. This in-depth, close-up experience is specially designed for people of all ages. Admission is free for children under the age of three when accompanied by a paying adult. There is no better way to discover these sweet and charming aquatic mammals. During your Dolphin Encounter, you and your family will have the incredible opportunity to meet and interact with these playful animals. Our small group sizes guarantee a hands-on experience for everyone. Your adventure will begin with a brief, fun orientation. Our certified trainers will teach you how to use hand signals and reinforcement to communicate with the dolphins. You will learn how our wonderful team takes care of these majestic creatures while also discovering amazing facts about them. Then it will be time to experience their loving disposition while standing in the water with them. Education and hands-on contact will make this an unforgettable experience. Our interactive Dolphin Encounter ensures that everyone gets a kiss, hug, and handshake. Connect with these marine animals while swimming in the water with them. You will also have the option to get your picture taken to commemorate your magical day. This incredible Dolphin Encounter is an exceptional experience that is the perfect entertainment for the entire family. Make your dreams of swimming with dolphins come true. We have three daily shows to choose from. Book now for the experience of a lifetime. Please note that you should arrive 30-minutes before your encounter begins. Lockers, showers and towels are provided free of charge. Remember to apply biodegradable sunscreen to protect yourself and the marine environment. We recommend that you call our office if you have any physical or health concerns. Women more than five months pregnant are not allowed to participate due to safety concerns. We are currently not accepting US dollars, so please bring an international credit or debit card. In Six Flags Mexico, groups have a maximum of 20 people.